Kuala Lumpur (VNA) – Athletics and taekwondo athletes brought joy for Vietnam with three gold medals in the afternoon of August 26 at the ongoing SEA Games 29 in Kuala Lumpur. 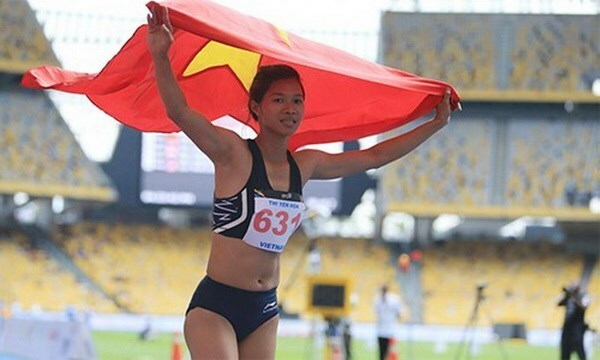 Runner Tran Thi Yen Hoa came first in the 100m hurdles race, bringing the first gold medal for Vietnam in the 7th competition day. Her medal is also the first in this event for Vietnam after 22 years. Runner Nguyen Van Lai won another gold of the day for the athletics team with a record of 14 minutes and 55.15 seconds in the men’s 5,000m event. The same day, taekwondo artist Chau Tuyet Van, Lien Thi Tuyet Mai, and Nguyen Thi Le Kim secured the highest point of 8.43 in the women’s poomsae team event, winning a gold medal for Vietnam. In the men’s poomsae team event, Ho Thanh Phong, Le Hieu Nghia and Nguyen Thien Phung got a bronze for their 8.29-point performance, while Chau Tuyet Van and Ho Thanh Phong won a bronze medal with 7.26 points in the poomsae pair event.